A woman votes in the first round of the Tunisian presidential election on Nov. 23. The election went smoothly, but no candidate won 50 percent of a vote, forcing a runoff between the top two on Sunday. 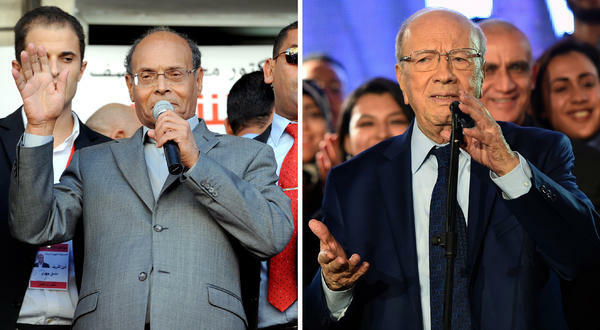 The two candidates in Sunday's runoff presidential election are incumbent Moncef Marzouki (left), who has been serving on an interim basis, and Beji Caid Essebsi, 88, who held posts in the old regime that was ousted in 2011. In another tent just down the road, patriotic music plays for Moncef Marzouki, a former human rights activist who has held the job of president for three years on an interim basis while the new constitution was written. Tunisia stands out in a region roiled by violence, chaos and the resurgence of despotism. If there is a democratic handoff for the head of state, it will mark the most peaceful transition of power born from the wave of revolts that swept through the Middle East in 2011. The race is close. And the choice is being cast as a vote between a soft version of the old regime, represented by Essebsi, and a disheveled populist, Marzouki, who draws power from an Islamist base. A major reason that a peaceful transition is possible in Tunisia is that the Islamists didn't seek to dominate when they came to power. "The best way to describe the Tunisian experience is the experience of consensus and not the experience of conflict," says Rachid al-Ghannouchi, a founder of Tunisia's most powerful Islamist movement, Ennahda. He says his party wanted to avoid polarizing the populous like the Muslim Brotherhood did in Egypt. There, the brotherhood came to power in 2012 but were thrown out in a military coup a year later that included a violent crackdown against the group. So Ghannouchi's party agreed to dissolve the Cabinet that it controlled. And to avoid conflict between secularists and Islamists, it didn't put forward a presidential candidate. Ghannouchi says that in the long run, it's wise politics. "For us, the success of the democratic experience is more important than our party's interests," he says. "Allowing the democratic experience to survive, even with a man from the old regime, will allow us the chance to come back to power in the future. But if the experience fails, then everything will fail and we will enter the world of terrorism and chaos." That chaos is visible throughout the region. Next door in Libya, two rival governments and their militias are wreaking havoc. Syria is in a civil war and Yemen is on the brink of collapse. "Tunisia is the standing tree in a collapsing forest from here to Iraq," says Ghannouchi. That desire to remain standing is what makes this election significant. In downtown Tunis, Mohamed Nasr says he's voting for Essebsi. "It's decisive; it's going to be a turning point that will save the country," says Nasr. He thinks Marzouki and the Islamists elected to the legislature in 2011 hurt the economy and fostered extremism in Tunisia. Nearby, a woman named Leila speaks up. My brother was tortured and imprisoned for being an Islamist under the old regime, she says. The government that Essebsi served did that to him. That's why she's voting for Marzouki. But she won't give her full name, she says. She's afraid that with the shift of power, the Islamists could be targeted again. And now, a bright spot from so-called Arab Spring. This series of uprisings against Arab dictators mostly produced conflict rather than democracy. And the Arab Spring didn't even start in the spring. It started in December of 2010 in Tunisia. As it turns out, the transition there has been mostly peaceful. 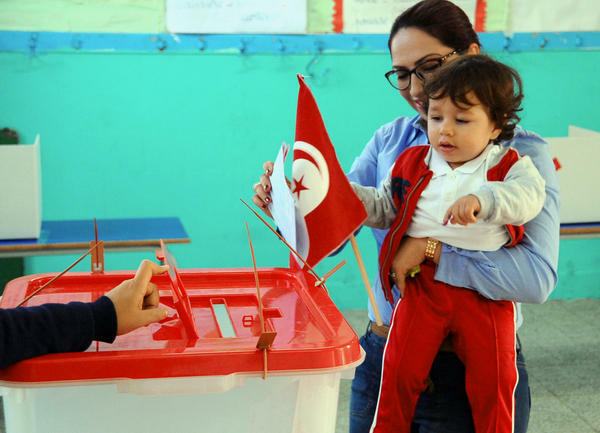 This weekend, Tunisians hold the runoff in their first general election for president. NPR's Leila Fadel has this report. LEILA FADEL, BYLINE: The main boulevard in downtown Tunis is alive with political debate about the two candidates for president. In one tent, campaign workers play music and hand out flyers for candidate Beji Caid Essebsi, an 88-year-old statesman who served in the old regime that Tunisians ousted. And in another tent just down the road, patriotic music plays for Moncef Marzouki, a human rights activist who had the job on an interim basis while the constitution was written. Tunisia is an anomaly in a region roiling in violence, chaos and the resurgence of despotism. And if there is a democratic hand-off for the head of state, it will mark the most peaceful transition of power born from the wave of revolts that swept through the Middle East in 2011. The race is close and a choice is being cast as a vote between a soft version of the old regime, represented by Essebsi, and a disheveled populace, Marzouki, who draws power from an Islamist base. A major reason that a peaceful transition is possible in Tunisia is that the Islamists didn't seek to dominate power. RACHID AL-GHANNOUCHI: (Through translator) The best way to describe the Tunisian experience is the experience of consensus and not the experience of conflict. FADEL: That's Rachid al-Ghannouchi, one of the founders of Tunisia's most powerful Islamist movements, Ennahda, explaining why the Islamists compromised. He says his party wanted to avoid polarizing the populace like the Muslim Brotherhood did in Egypt. There, a military coup forced the Brotherhood from power and it was followed with a violent crackdown. So Ghannouchi's party agreed to dissolve the cabinet that it dominated and to avoid conflict between secularists and Islamists, it didn't put forward a presidential candidate. Ghannouchi says in the long run, it's wise politics. AL-GHANNOUCHI: (Through translator) For us, the success of the democratic experience is more important than our party's interest. Allowing the democratic experience to survive, even with a man from the old regime, will allow us the chance to come back to power in the future. But if the experience fails, then everything will fail and we will enter the world of terrorism and chaos. FADEL: That chaos surrounds Tunisia. Next door in Libya, two rival governments and their militias are wreaking havoc. Syria is in a civil war and Yemen is on the brink of collapse. Again, Ghannouchi. AL-GHANNOUCHI: (Through translator) Tunisia is the standing tree in a collapsing forest from here to Iraq. FADEL: And that urgency to stay standing dominates the view of this election. Back downtown, Mohamed Nasr says he's voting for Essebsi. MOHAMED NASR: (Through translator) It's decisive - it's going to be like a turning point that will save the country. FADEL: He things Marzouki and the Islamists that were elected to the legislature in 2011 hurt the economy and fostered extremism in Tunisia. Nearby, a woman named Leila speaks up. My brother was tortured and imprisoned for being an Islamist under the old regime, she says. The government that Essebsi served did that to him. That's why she's voting for Marzouki, but she won't give her full name, she says. She's afraid that with the shift of power, the Islamists could be targeted again. Leila Fadel, NPR News, Tunis. Transcript provided by NPR, Copyright NPR.